Eastern Mojave Vegetation Blue Rock Mine. I met Bill Brown, owner of the Blue Rock Mine in Macedonia Canyon, one afternoon in about 1985. He told me the Blue Rock Mine was his, and that he mined "pods" of scheelite (tungsten ore) even though there was substantial copper mineralization on his property. He also said he lived in Los Angeles, and drove out to his mine on the weekends. He kept his trailer and "jeep" at the Cima Store. I haven't seen Bill since, the roof is torn off of his cabin, and the trailer at Cima Store looks to be abandoned. Macedonia Canyon Road - Mojave National Preserve: Blue Rock Mine. 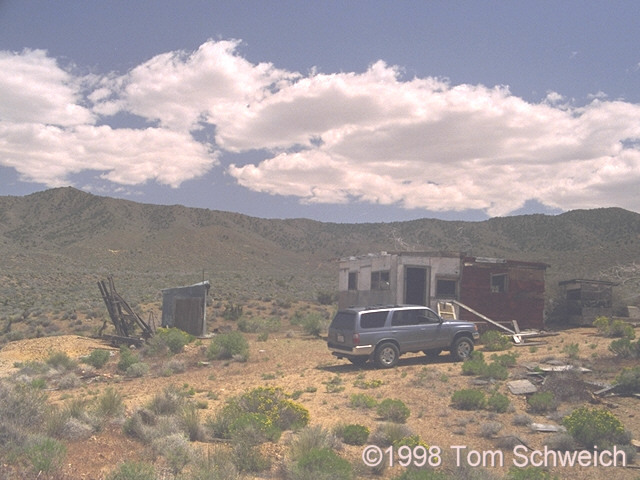 Eastern Mojave Geology -- A Botanist's View: Blue Rock Mine. Other photos about Economic Geology or Blue Rock Mine.